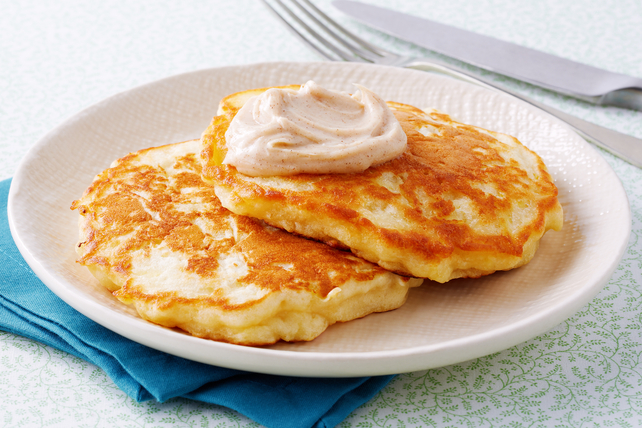 Beat cream cheese product, 1/4 cup sugar and cinnamon with mixer until blended; refrigerate until ready to use. Combine flour, baking powder, salt and remaining sugar in large bowl. Whisk eggs, milk, oil and vanilla in medium bowl until blended. Toss apples with lemon zest and juice. Add to egg mixture; mix well. Add to flour mixture; stir just until moistened. Ladle batter onto hot nonstick griddle or into hot nonstick skillet, using 1/4 cup batter for each pancake. Cook until bubbles form on tops, then turn to brown other sides. Serve with cream cheese mixture. Prepare using Gala or Granny Smith apples. Place pancakes in shallow pan in 200ºF oven to keep warm until all pancakes are cooked and ready to be served.